Background and purpose In recent years, implantation of flow diverters has emerged as an option for the endovascular treatment of intracranial aneurysms. One complication of treatment with flow diverters is the occurrence of in-stent stenosis, which has been reported to be partially reversible. The purpose of our study was to assess the incidence and dynamics of in-stent stenosis on angiographic short term and long term follow-up after treatment with flow diverters. Methods A retrospective review of our prospectively maintained database identified all patients with intracranial internal carotid artery (ICA) aneurysms treated by flow diverters at our institution between 2014 and 2017. Clinical charts, procedural data, and angiographic results were reviewed. Results 18 patients were included. The mean short term follow-up was 92±19 days and mean long term follow-up was 449±120 days after treatment. No neurologic complications were observed. There was no procedure related mortality. Long term angiographic results showed complete occlusion in 83.3%, neck remnants in 11.1%, and incomplete occlusion in 5.5% of cases. In-stent stenosis was observed in all cases. Mean stenosis improved significantly from 30% on short term follow-up to 12% on long-term follow-up (P<0.0001). Conclusion In-stent stenosis is a common finding on short term follow-up after the treatment with flow diverters but improves over time. In our clinical practice, we observed cases with ISS after short term follow-up (FU) which were partially or fully reversible after long term FU. The purpose of this study was to investigate the incidence and dynamics of ISS associated with FDs for the treatment of intracranial aneurysms of the internal carotid artery (ICA). The research was conducted according to the principles of the Declaration of Helsinki. Our regional ethics committee approved the research protocol (266/17). We retrospectively identified all patients who consecutively underwent endovascular treatment of an intracranial ICA aneurysms with an FD between 2014 and 2017. The FDs implanted were FRED (Microvention, Tustin, California, USA), Derivo (Acandis GmbH, Pforzheim, Germany), and Pipeline Flex (Medtronic, Minneapolis, Minnesota, USA). Patients were identified from our registry of neuroendovascular interventions. short term (between 2 and 4 months) and long term (>9 months) FU angiography. For better comparability of ISS, fusiform aneurysms and procedures in which multiple stents were used were not included. Endovascular treatment was performed under general anesthesia via a femoral approach. All patients received dual antiplatelet therapy before and heparin therapy during the procedure. Platelet function testing is not performed routinely at our institution before FD implantation. After the procedure, dual antiplatelet therapy (clopidogrel 75 mg/day and aspirin 100 mg/day) was administered for 6 months and aspirin 100 mg/day thereafter. The endovascular procedures were performed with a biplane angiographic system (Artis Q Biplane, Siemens, Erlangen, Germany). Balloon angioplasty was not performed during the procedures. ISS was analyzed on follow-up DSA that was performed routinely at 3 and 12 months after treatment. Angiograms were retrospectively reviewed by two raters in consensus. Anatomic outcome was classified according to the revised Raymond–Roy Occlusion Classification (RROC) into one of the following groups: complete occlusion (RROC1), remnant neck (RROC2), or residual aneurysm (RROC3). Further adequate wall apposition of the stent margin in relation to the contrast filled vessel lumen after stent deployment was assessed. ISS was defined as a reduction in the parent vessel lumen filled with contrast in follow-up angiograms compared with pretreatment angiograms. To reduce the inaccuracy of the measurements in consecutive angiograms in the same patient that may occur due to different detector distances, measurements were normalized by the diameter of the vertical part of the petrous portion of the ICA on lateral view angiograms (figure 1). Dynamics of in-stent stenosis (ISS) after flow diverter implantation (patient No 14). 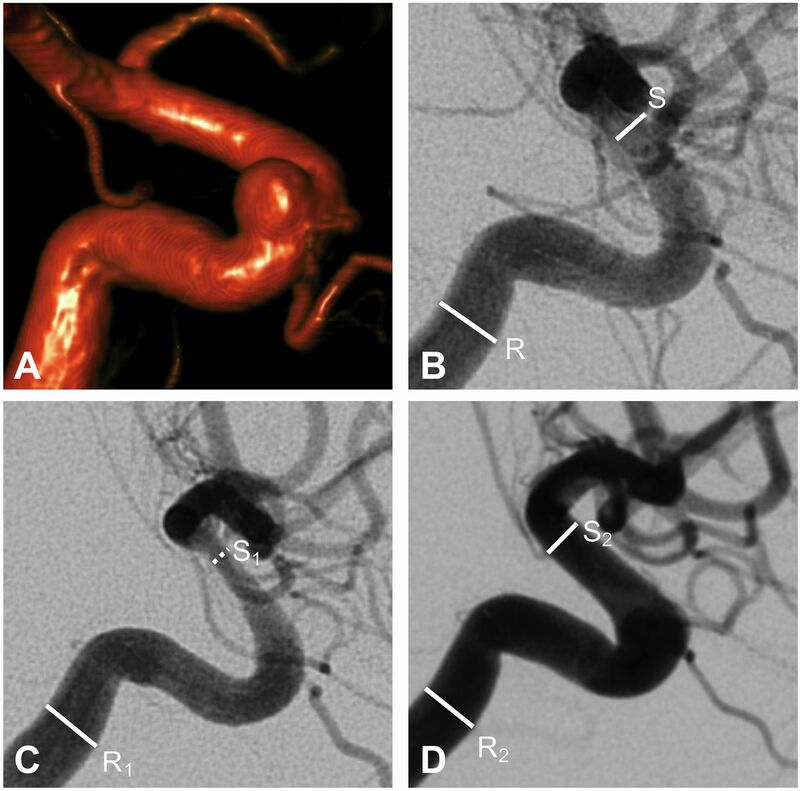 (A) Pre-interventional three-dimensional angiogram and (B) lateral view of a para-ophthalmic internal carotid artery aneurysm. (C) Lateral view of the short term follow-up (FU) angiogram after 3 months, with 49% stenosis (broken line) (ISS(short term FU)=100−((S1/R1)×100))/ (S/R)), and (D) after 10 months, with 21% stenosis (ISS(long term FU)=100−((S2/R2)×100))/ (S/R)). ISS was graded as mild (<50%), moderate (50–75%), or severe (>75%). In addition, we assessed location and categorized it as focal (proximal, mid, or distal stent) or diffuse stenosis. Further positioning of the FD was assessed. Hence different positions were defined as follows: central=mid portion of the FD across the aneurysm neck; proximal=proximal third of the FD across the aneurysm neck; and distal=distal third of the FD across the aneurysm neck. Clinical records were evaluated to assess whether there were any neurologic complications. Data from 49 consecutive patients with intracranial ICA aneurysms treated with FDs in our department were retrospectively analyzed (33 women, mean age 51.2±12.4 years). Data from 31 patients were excluded from the analysis because multiple stents were implanted (n=7), or short term or long term FU angiograms were not available (n=16). Eight patients were excluded because of fusiform aneurysms. Data from 18 patients was included (13 women, mean age 53±14 years). Endovascular treatment was successful in all patients, with six treated with the FRED, six with the Derivo, and six with the Pipeline Flex stent. Mean short term FU time was 92±19 days and mean long term FU was 449±120 days after implantation. Patient demographics, aneurysm features, and procedural details are shown in table 1. Aneurysms had a mean transverse diameter of 4.8±3.4 mm and a mean height of 4.1±1.9 mm. No stent migration or kinking was seen. No stent occlusion was observed. No procedure related ischemic or hemorrhagic complications occurred. In 13/18 cases (72.2%), the FD was placed centrally across the aneurysm neck. In 4/18 cases (22.2%), the aneurysms were covered by the proximal third of the FD and in one case (5.5%) by the distal third. In one case (5.5%), periprocedural mild vasospasm of the parent vessel was seen that resolved after 10 min without additional treatment and no further procedures were required. In one case (patient No 6), partial insufficient wall apposition of the proximal FD was observed on FU, not resulting in ISS. Complete occlusion (RROC1) was observed in 12/18 cases (66.7%) on short term and in 15/18 (83.3%) on long term FU. Residual neck (RROC2) remained in 2/18 (11.1%) cases on short term and in 2/18 (11.1%) on long term FU. Residual aneurysm (RROC3) remained in 4/18 (22.2%) cases on short term and in 1/18 (5.5%) on long term FU. ISS was observed in all cases. Moderate ISS occurred in one case (patient No 13) on short term FU. In all other cases (17/18 (94.4%)) mild ISS was found. Mean ISS on short term FU was 30%. On long term FU, ISS significantly improved in all patients, resulting in a mean ISS of 11% (P<0.0001). Localization of ISS was always focal; no diffuse ISS was seen (table 1, figure 2). No patient was symptomatic and no re-treatment was performed. Focal in-stent stenosis (ISS) after flow diverter implantation. (A) Frontal view of pre-interventional angiogram of a supra-ophthalmic internal carotid artery (ICA) aneurysm and (B) after 3 month short term follow-up (FU) (patient No 2). (C) Lateral view of pre-interventional angiogram of a para-ophthalmic ICA aneurysm and (D) at the 3 month short term FU (patient No 16). 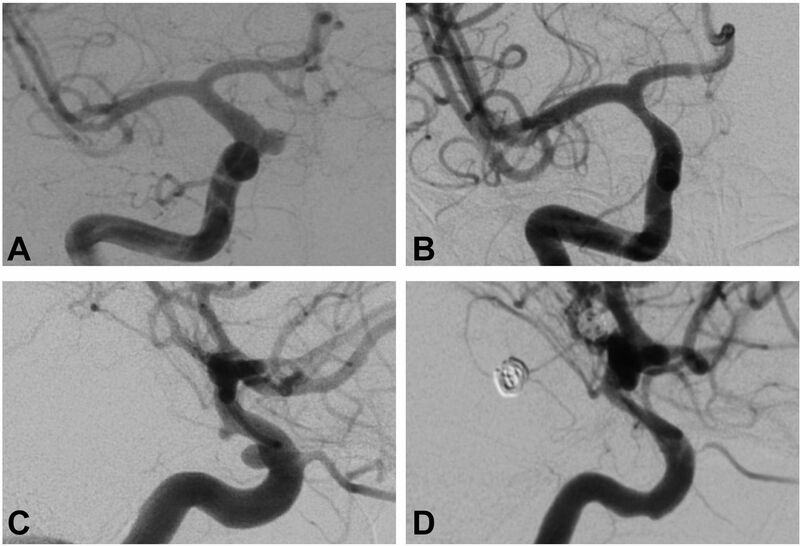 In this study we analyzed the incidence of ISS after FD implantation in the intracranial ICA on short and long term FU angiograms to investigate the dynamics and clinical relevance of ISS. ISS is a well known issue of endovascular stents, especially in coronary artery treatment,15 16 and has also been described for intracranial stenting with conventional lasercut stents in a few studies.17 18 The reasons for ISS are not fully understood. Various animal models have shown different phases of cellular response after stent deployment, causal for ISS. These are summarized by Schwartz et al 19 as: early phase—thrombus formation and inflammation; intermediate phase—endothelialization and granulation tissue; and late phase—smooth muscle cells and matrix formation. The occurrence and degree of ISS for the recently introduced flow diverting stents, which have a higher metal to artery ratio are less described in the literature. ISS was noted in previous preclinical studies with treatment with FD.5 20–22 There are few clinical data on ISS when FDs are used. Cohen et al 13 reviewed the delayed consequences of FDs in 34 patients, 18 treated with a pipeline embolization device (PED) and 16 treated with the Silk (Balt, Montmercy, France) FD. DSA was performed at 2, 6, 9–12, and 16–20 months post procedure. ISS was observed in 38% of Silk FDs and 39% of PEDs on initial follow-up angiography. In the majority of cases (9/13), mild ISS was observed. One patient was symptomatic and suffered from recurrent transient ischemic attacks. Similar to these findings, John et al 12 found in their retrospective analyses of 51 patients treated with a PED an overall ISS of 41% (including intimal hyperplasia) with no clinical symptoms or retreatment. In addition, they observed an improvement in stenosis in 2/5 cases of moderate stenosis. Recently, Aguilar Pèrez et al 14 recognized ISS in 29% (65/223) of patients treated with p64. In the majority of cases (40/65), mild ISS was observed. Moderate ISS was found in 19/65 and severe ISS in 6/65 cases, none of which led to clinical symptoms; however, in one case of severe ISS, balloon angioplasty was performed. The highest rate of ISS in the literature was described in a retrospective analysis of Lubicz et al.1 They observed in 47 cases treated with Silk FDs at short to mid-term FU an overall ISS of 57%, of which 19% were severe stenosis. Our finding of ISS in all patients treated with FDs on short term FU emphasizes the fact that the histological reactions after FD implantation are not fully understood. Preclinical research that focuses on the time interval between 3 and 9 months after treatment is needed. Our study has several limitations inherent to a retrospective design. Another limitation is the small number of patients, but in our study we focused only on the intracranial ICA, in contrast with other studies. ISS is a common finding after treatment with FDs. It appears in the majority of patients as mild and shows improvement on long term FU. However, in our study, no ISS related neurologic deficits were seen. Contributors RM-B: substantial contributions to the conception, design, analysis, and interpretation of data for the work; drafting the work and revising it critically for important intellectual content; final approval of the version to be published; and agreement to be accountable for all aspects of the work in ensuring that questions related to the accuracy or integrity of any part of the work are appropriately investigated and resolved. AH, AS, TT, WR, and UY: substantial contributions to the design of the work and analysis of data for the work; revising the work critically for important intellectual content; final approval of the version to be published; and agreement to be accountable for all aspects of the work in ensuring that questions related to the accuracy or integrity of any part of the work are appropriately investigated and resolved. Ethics approval The study was approved by the ethics committee of Saarland, research protocol (266/17).